Well, I love Science Friday. I listen to podcasts of it now almost every day when I bike to work. It is a brilliant show, covering a wide range of science and science related topics in depth. Plus it is freely downloadable in a variety of formats. And they have a great website too. But every once in a while they get something a bit wrong. Yesterday, on my way home from a new introductory biology class we are teaching at Davis on "The Tree of Life" (which I will write more about later), I was listening to a Science Friday about Fungi (Science Friday Archives: The Fabulous Fungi). And unfortunately, in the introduction, Joe Palca started off with a pretty outdated discussion of the tree of life. When you ask people to name the kingdoms, most people get the big ones, animals, plants, bacteria. Some people may even come up with the protists. But there is one more. Here's a hint. Yeast are part of it. So are shitakes. Are you getting it? Well the answer is fungi. Today we talk about the Three Domains (Bacteria, Archaea and Eukaryotes) and within each of those domains, they are many lineages (which are sometimes referred to as kingdoms). But the five kingdom concept is done and gone. The modern tree looks more like the following (which is an adaptation for our book of a tree by Baldauf). Mind you, the show on Fungi is worth listening to (although they did miss the opportunity to use the tree of life to answer a question that came up on "Are fungi from outer space?" - the answer should have been - "No, fungi are deeply embedded within the tree of life on this planet, so if life came from elsewhere, it was at the beginning of the origin of life"). Unfortunately, I could not call in to the show (as I have done before) to try and comment on these issues (since I was not listening live). 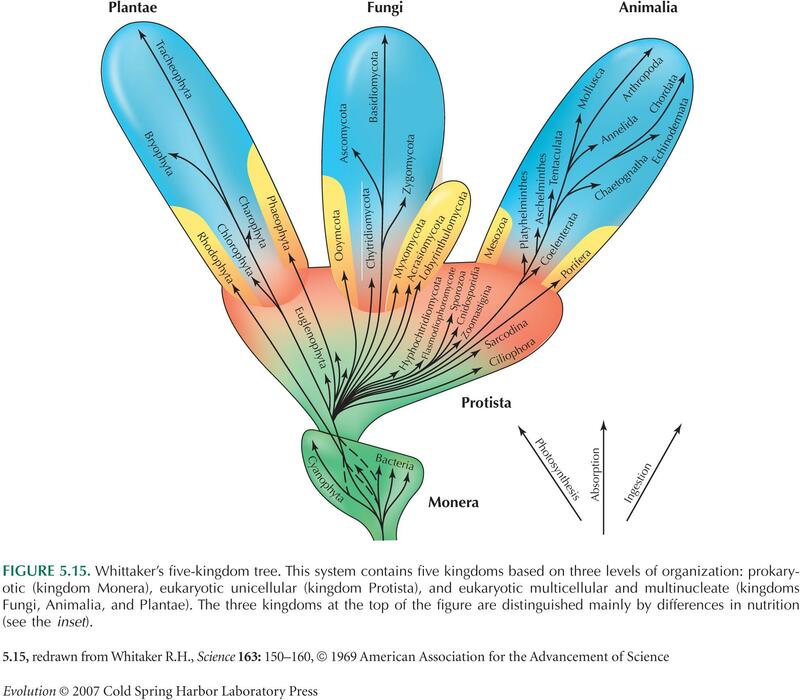 So instead, I am giving Science Friday my Second "Twisted Tree of Life" Award for ignoring the new concepts of the tree of life that have been in play since Woese, Fox and others first laid the groundwork for the existence of the Archaea. Of course, most non-biologists probably think things are still classified as animal, vegetable, mineral, and the idea that fungi aren't plants is pretty novel to them. 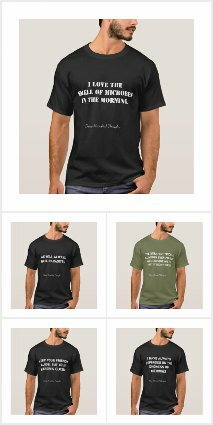 Well, what about the Fungi from Yuggoth? Always a threat, particularly now that they are sure to be insulted as human astronomers have removed the planet status of their home Yuggoth (Pluto). As for Yuggoth, I am going for convergent evolution to explain them. But I will ask. One lives next door to me. so...can fungi still be called a kingdom, or has that name become obsolete? the problem with the Science Friday was the lead in referring to the five kingdoms. In the modern tree of life, fungi are just one of dozens of major eukaroytic lineages. In many cases, these lineages are referred to as kingdoms, but there are many many many of them. And bacteria are not a kingdom. Nor are protists. We all agree that Five Kingdoms in dead. Problem is, I think the Three Domain Hypothesis is also dead [The Three Domain Hypothesis]. Now, you don't have to agree with me but I think it's important to at least acknowledge that there are other legitimate scientific alternatives. There's the Web of Life Hypothesis and even a Two Domain Hypothesis (Eukaryotes & Prokaryotes). There are several fusion hypotheses that try to reconcile all the data. How come these aren't covered in your book? Why do you take the dogmatic position that the ribosomal RNA based Three Domain Hypothesis is the correct tree? Most of the fundamental highly conserved enzymes of metabolism give a Two Domain tree. What is your reason for dismissing this data without even a mention? Larry - good points. Here are some mea culpaesque responses. 1. Agree that there are perfectly reasonable alternatives worth presenting. 4. Yes, clearly in edition 2 we should make this more explicit and present a non dogmatic treatment. 5. I personally do not know where I stand on the issue but simply fall back to the three domains as an easier way to go sometimes out of laziness. The problem I have with "objections" to the three domains is that the modern ones aren't really "objections" but just refinements. Ultimately the question that needs to be answered is why the core of biology -- information processing -- is basically the same in archaea and eukaryotes and not in Bacteria. If people want to claim that this is due to a fusion event involving an or something then fine -- but it doesn't really change the issue that bacteria are not like the archaea and eukaryotes. But these modern theories are different from the old-fashioned objections that simply said "my favorite gene phylogeny disagrees with rRNA tree and I'm right", because they accept that the similarity between Archaea and Eukaryotes isn't just an conclusion from a tree but is based on experimental studies of transcription and translation. Ultimately the question that needs to be answered is why the core of biology -- information processing -- is basically the same in archaea and eukaryotes and not in Bacteria. Actually there are several questions that need to be answered. 2. Why are the genes required for the core of biology—basic metabolic pathways—so alike in eubacteria and archaebacteria but different in eukaryotes? 3. Why do so many gene phylogenies show archaebacteria as a cluster within the other bacteria? As long as these important questions are in the air, it is absolutely, scientifically, essential not to take a dogmatic position about one particular hypothesis that doesn't even account for the data. That's not how science is supposed to be done. ... because they accept that the similarity between Archaea and Eukaryotes isn't just an conclusion from a tree but is based on experimental studies of transcription and translation. I think you'll find that most of those studies are not what you think they are. Here's one of the most important facts that workers overlook: not all bacteria are like E. coi. Most of the published studies show some differences between arachaebacterial processes and those in E. coli. They conveniently ignore the fact that E. coli also differs from gram positive bacteria such as B. subtilis and other distantly related species such as the cyanobacteria. That's something you should know about, Jonathan. Many of these other species are also more similar to some aspects of eukayotic processes than E. coli. What does that tell you about Three Domains? True, there are a few examples of proteins that are more similar in eukaryotes and archaebacteria (e.g. TBP) but there are others that are more similar in other bacterial species and eukaryotes. Those who are committed to the Three Domain Hypothesis spend all their time focusing on data that supports their belief and very little on designing experiments that would falsify their hypothesis. I personally do not know where I stand on the issue but simply fall back to the three domains as an easier way to go sometimes out of laziness. The trick is to try and avoid this laziness. There's too much of it in science these days. Yes, avoiding laziness is good. As for resolving the tree, this is why I have been working to sequence genomes from across the tree of life (and Jonathan B. has been helping with this). Previously, Jonathan B, me, and Naomi Ward and others sequenced the first genome from eight phyla of bacteria for which no genomes were available. We are writing up some papers on these genomes now. And now I am coordinating a project being done at the joint genome institute where we are sequencing 100s of genomes selected from across the tree of bacteria and archaea (we are calling this a Genomic Encyclopedia of Bacteria and Archaea - or GEBA - see here . Of course, with nothing else to go on, we have to use the rRNA tree as our guide. But we then use the genomes to tell us about the evolution of these organisms and not the rRNA tree. Maybe we can organize a "phylogeny" jamboree where everyone takes the genomes and uses them to look at phylogenetic questions. 1) Archaeal transcription uses homologs of TFIIB and TBP that eukaryotes use. Bacteria (not just E. coli, but *all* bacteria, including Bacillus and Cyanos) use a completely different system involving sigma factors. Similarly, archaeal translation uses homologs of the eukaryotic initiation factors while bacteria (again, *all* bacteria) *don't*. 3) Some genes just are really bad phylogenetic markers and disagree with the consensus phylogeny. You can invoke the trendy explanation of HGT to explain this, or you can just use the more traditional explanations of gene loss and unequal rates of evolution. Either way, really. 1. I think lateral transfer has not obscured the tree completely and that lineages have a core that is relatively recalictrant to gene transfer. Thus one can draw a tree of life that represents the average phylogeny of species. 3. I think the history of eukaryotes is still a bit unclear .. regarding for example whether they represent a fusion of lineages or what. 4. 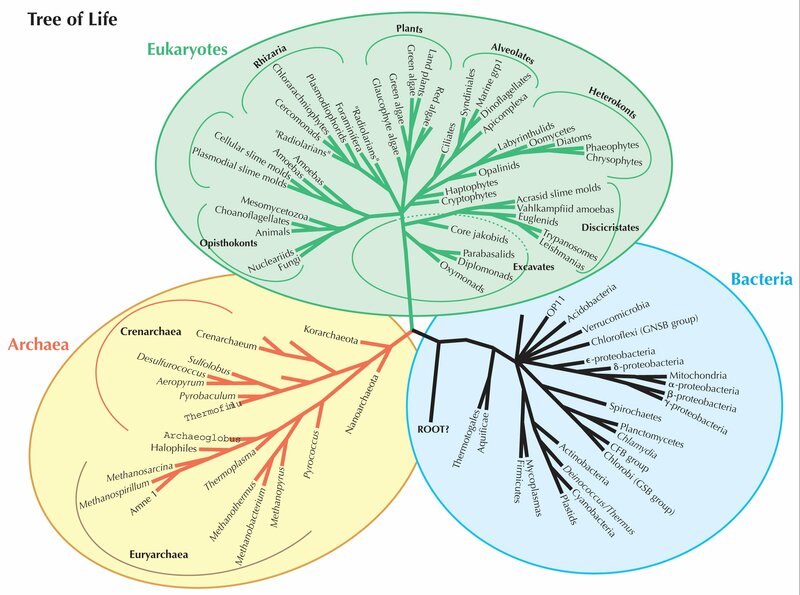 I think even if we knew what the history of eukaryotes was, we still have a problem with rooting the tree of life. This impacts whether or not we consider archaea and/or bacteria to be true monophyletic groups or not. Archaea could for example evolve from within the bacterial domain. This would be consistent with Jonathan's points about archaea having relatively distinct molecular systems and would also be consistent with some of the ambiguous patterns seen with some phylogenetic trees. 5. I personally still favor the three domain hypothesis as being the "dominant" signal in the tree of life and think that some of the other patterns might be due to (1) lateral gene transfer of a subset of genes (2) unusual history of eukaryotes complicating things and (3) that the phylogenetic trees of some genes do not actually reflect the evolutionary history of those genes (e.g., due to convergence, bad alignments, etc). I think lateral transfer has not obscured the tree completely and that lineages have a core that is relatively recalictrant to gene transfer. Given that you don't know the phylogeny, since that's the question you're trying to answer, how do you define the "core"? The way it's been defined by the supporters of the Three Domain Hypothesis is that "core" proteins are identified by the fact that their phylogeny support the Three Domain Hypothesis. All proteins that support other hypotheses are thus due to lateral gene transfer. Doesn't that seem a bit illogical? Actually I do not define the core that way ... I define the core as genes that show similar phylogeny to each other, regardless of whether they support the three domain hypothesis or the eocyte or the ring of life or whatever. This is something akin to what Ochman and Moran and Daubin did for gamma proteobacteria a few years ago. In my opinion, when one does this for any particular group, one does find that there are many genes that give similar trees to each other. Thus impleis to me that LGT has not wiped out the phylogenetic history. Ford Doolittle would argue that this simply could be due to these organisms exchanging genes with each other. I do not buy his argument in this case (but buy most of his other ones). I define the core as genes that show similar phylogeny to each other, regardless of whether they support the three domain hypothesis or the eocyte or the ring of life or whatever. There is a group of genes whose phylogeny supports the Three Domain Hypothesis and there's a group of genes that show archaebacteria as a group within the other bacteria. Both groups encode fundamatal conserved proteins. How do you decide which ones are "core" and therefore which phylogeny is "correct"? The consensus is that the group encoding translation proteins are the real core and the ones encoding basic metabolic enzymes are not. I sometimes wonder if the consensus would have been different, and the arguments just as strained, if it had turned out the other way around. I suspect so. I suspect we would be subjected to a multitude of arguments defending the idea that basic metabolism is far more "core" than translation and that the genes involved in translation could easily have been subject to lateral gene transfer. In fact, Ford Doolittle has been known to make that argument just for fun. I found it very instructive. I appreciate the point about whether opinions would be different if translation proteins vs. metabolic ones showed some sort of reverse pattern. But I am not personally aware of the pattern you report. In my knowledge, what we see if that there are a set of proteins that give a similar pattern to each other - and these can be called the core. These proteins give similar phylogenetic signal at many levels - from the genus to the order to the phylum to the domain. Then there are other proteins, many of which do give some sort of conflicting signal compared to the core and many of which do have some pattern inconsistent with the three domain tree. However, these proteins generally do not give similar phylgoenetic signal to each other at many levels of resolution as far as I am aware. To me, this is suggestive that these proteins are not ideal phylogenetic markers. If they were good markers it should not matter what level one looks at. So to me there are not two cores - one translational and one metabolic. There is really one dominant core that gives some sort of consistent signal. And then there are the other genes. Lets put this another way. Sure, if you ask a very specific question about all the genes in one genome and you divide the world of trees into a small number of bins (e.g., genes in genome X group with eukaroytes = bin 1, genes in genome X group with gram positive bacteria = bin 2, genes in genome X group with other bacteria = bin 3) then sure, you can assign genes into one of these few bins. And there does appear to be conflicting signal. But the cause of this conflict to me is hard to resolve because there are many possible explanations. But I am not talking about doing this. I am talking about scanning through a genome for genes that give similar patterns at every level at which you look. And I define these as the core. It has nothing whatsoever to do with what pattern they show. It has to do with whether they agree with each other. If there were two distinct cores in which one set showed one clear pattern and for which the different genes agreed at every level and another set showed another pattern with agreement at every level, that would be great. For example, the metabolic genes generally seem to disagree with each other a lot within what we could call phyla. Sure, at deeper levels many of them may suggest archaea are not monophyletic, but if they show inconsistent patterns in more recent evolution, I do not get why we should trust them for even deeper evolutionary questions. In other words, I have seen no evidence for two of what I would call cores. I am not saying we have resolved all the early events in evolution but I do not want to use something as my signal when there is no evidence that its signal is to be trusted. Writing up an introductory blog entry for protists at the moment. I was looking up a 5 kingdom tree to rant about profusely, and ended up here. You know how many times people, even biologists, have given me the "Protists? 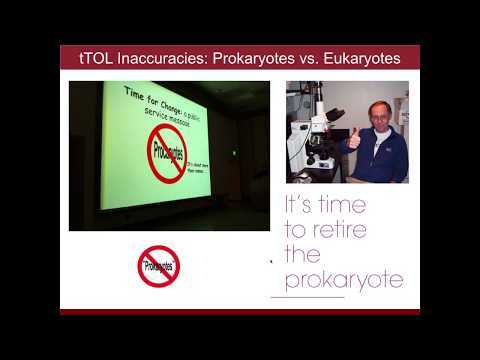 You mean the primitive eukaryotes!" crap... and modern day evolutionary biology(!) textbooks still show microsporidia branching off at the root!